The love-bubble between Winnie Nwagi and her baby daddy, Josh, has burst and the two are now not seeing eye-to-eye. Looking at the postings the Musawo singer is making online, the love between these two has vanished. She is doing it with a lot of anger, not even fans who are pleading with her to calm down is making a difference as artists like Fille, Sheebah Karungi and Bruno K, who are faced with similar problems or grew up under such circumstances are fully in support of her actions. Winnie fondly referred to her lover as #Detergent, a title to one of her love songs is so bitter that all Josh could provide was a mere cake on his daughter's graduation. "He is well paid, but very selfish of his own blood, can't even pay school fees or any bills as far as she is concerned, how mean and then you come up with just a cake, I can buy my daughter a cake too!!" 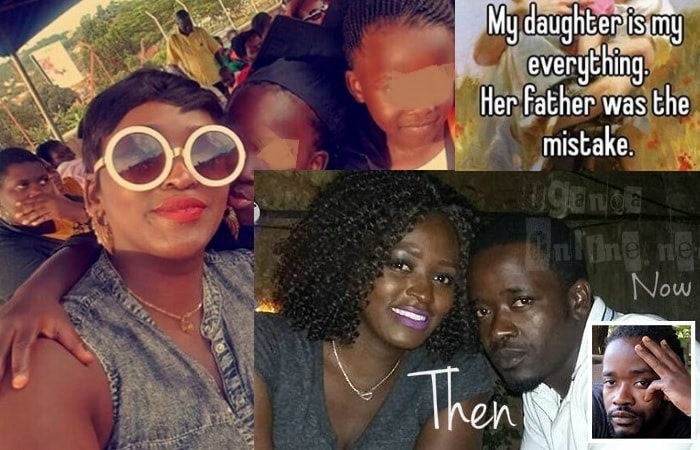 It all started with their daughter, Destiny, who graduated from nursery and will with effect from next year be in class 1, just like Bebe Cool's son, Caysan. "So after my daughter's graduation, guess what I found home, a cake from who? Happy Graduation day Destiny...from Dad." I'm like!! ooh what a fool..! Is that all you can provide for your daughter, a cake, Winnie went on to rant. 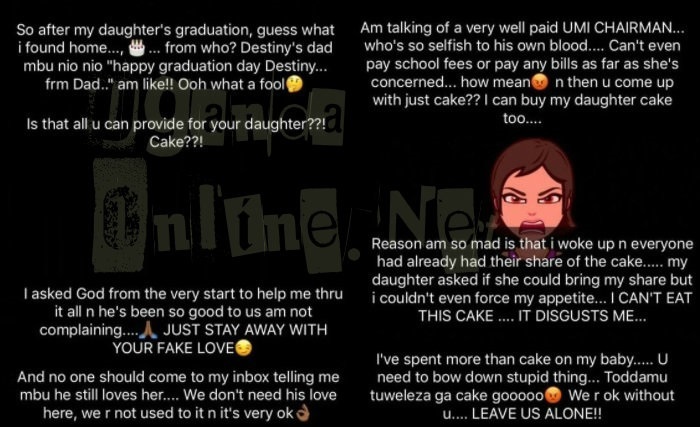 I've spent more than a cake on my baby, you need to bow down, stup!d thing, don't send us your fake cakes, we are ok without you, leave us alone," She concluded. She, then, put this post; "My daughter is my everything, Her father was the mistake." "Any man who can't be there for his child is useless. I stand with my sister, Winnie, on this." Bruno, you are also a man, you can't judge him because you don't know his story, another responded. Sheebah Karungi who was raised by only her mom also joined the thread; "My Mama is everything, my Father was her damn mistake, I hear you Nwagi.